The Houston Rockets aren't interested in losing basketball games. They landed in Miami at 4:00 am, were without the services of Trevor Ariza, Eric Gordon or Ryan Anderson, and had just played a tough game the night before to play against a tough matchup for them. There were plenty of excuses for the Rockets to let the grueling last game of a road trip go. Indeed, fatigue seemed to set in halfway through the game, with a huge lead turning into a deficit. 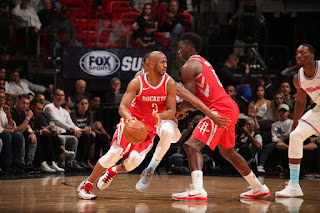 As the game came to a close, however, the Rockets were the ones adding another win to their total, and looking all the more impressive for it. James Harden was, predictably, the hero of the game. He had a massive 41 points on 13-25 shooting, including two back to back threes to put the game out of reach in the waning minutes.He then iced the game with a clutch steal which led to an infinitely open layup by Chris Paul. When the Rockets' offense was stagnating, Harden was there to pick it up and get it moving again. And the offense did stagnate. The Rockets led by as much as 17 in the second quarter, but 11 game minutes later had let the lead turn into a 4 point deficit. The Heat, Josh Richardson in particular, shot the lights out from three point range, putting them in prime position to capitalize on any sluggishness on Houston's part. It was touch-and-go as Goran Dragic went on a 10-2 run on his own against the Rockets to close the half, and then continued to cook Houston in the second half. It was, however, not enough. Chris Paul (24, 7 and 7) had no interest in losing and hit 3 of his 8 threes, each of which was crucial. Harden didn't care to lose either, and came in with 9 minutes left in the game to shake, bake, and put away the Heat. In what could have and perhaps should have been a loss, the Rockets instead close the gap behind the Golden State Warriors to a mere half game. The Rockets don't want to lose, even as other top teams seem to be willing to accept some losses. When the playoffs come around in April, the Rockets might just be glad they hung tough tonight.